The Ceramic Tile Education Foundation (CTEF) which provides education and installer certification for professionals working in the ceramic tile and stone industry gratefully accepts $150,000 from Coverings at the 2019 Coverings show in Orlando, Florida at the Orange County Convention Center. This increases the contributions from Coverings to over $1.5 million. 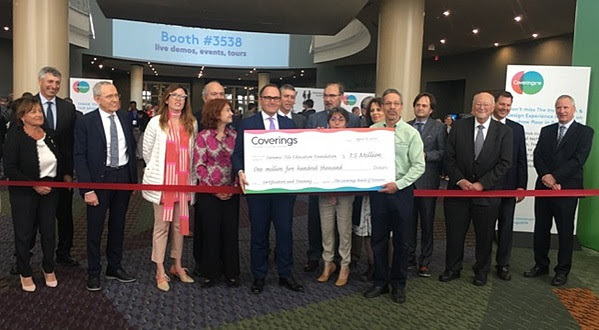 Coverings is the largest tile and stone show in North America with 9 miles of the latest trends and exhibitors from over 40 countries and attracting over 26,000 attendees. For thirty years, Coverings has been the most prominent event for the ceramic tile and natural stone industry in North America. To support the tile industry as Coverings does, learn more about becoming a CTEF Sponsor by clicking on https://www.ceramictilefoundation.org/become-a-ctef-corporate-sponsor-benefits. For more information, visit https://www.ceramictilefoundation.org.